Many women and the occasional man enjoy to pamper themselves with manicure and or pedicure from a local salon. The professionals at the salons are very well trained and use some of the most advanced equipment in order to provide their clients with the best experience and results. The electric nail drill is one of the most common tools that can be found in the well-stocked beauty salon or wherever manicures and pedicures are done. 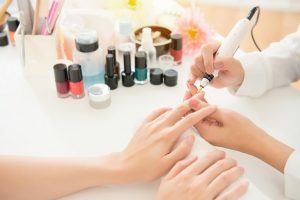 Unfortunately, when it comes to having your nails done by a professional in a salon you are going to have a hefty price to pay. Even if the place you go offers specials, chances are you are still going to shell out a ton of money to have your nails look beautiful. If you are looking to save yourself some money and try doing it yourself, you try one of the many nail drills that are designed to be used in the home. 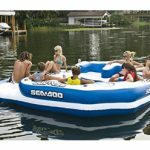 Many of them offer comparable features and functionality that you would find on the professional models used in many of today’s salons and day spas. 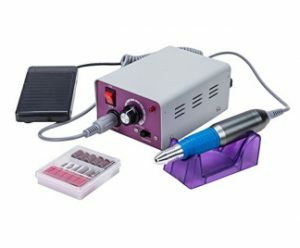 The Makartt Nail Drill Machine is a high-quality electric tool that makes it possible for anyone to do manicures and pedicures in the safety of their own home. The system comes with everything needed to work on any type of nails even acrylic, gel and of course natural nails as well. The nail drill is the small handheld unit the fits comfortably in the palm of the hand and by using the supplied tips you can perform a number of different operations on your nails including; polishing, grinding, cuticle removal and carving of your nails. The tips spin up to 30,000 rpm and the speed can be easily controlled using the slider on the front of the control unit. The unit can be operated in forward or reverse and there is a momentary pause to prevent damage to the motor/bearings when the switch to push. The Makartt Electric Nail Drill is very easy to operate at home and will help anyone turn their bathroom into a beauty salon. The relatively low cost will pay for itself in the amount of money you will save from not having to go to a salon. 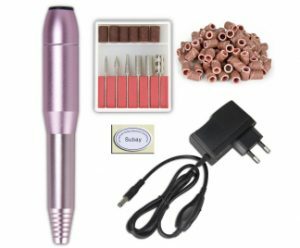 The Metallic Beautiful Nail Drill is a very portable unit that makes it easy to handle and take with you on a trip. There is no big, bulky control unit to have to lug around, just plug in the adapter and select the speed using the switch that is built into the power cord. The pen-like shape makes it really easy to handle and the pink metallic colors make it look cool. The handheld drill is the perfect size for most anyone to handle and the interchangeable tips can be removed and installed quickly. 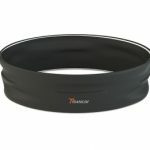 The package includes 6 grinding tips and 6 sanding bands on coming in a carrying case. The tips spin at a maximum of 20,000 rpm in the high setting and low speed is considerably slower. 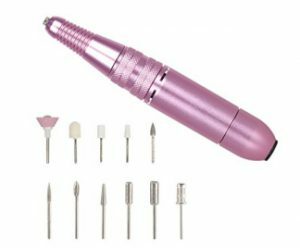 The Subay Metallic Beautiful Portable Nail Drill is best for both the professional salon and for home use as it is really easy to operate and looks pretty cool as well. The speed switch is really easy to use and makes it very simple to switch between fast and low. The Professional Manicure & Pedicure System from PureNails is a complete at-home nail care system that anyone can use. The compact nail grinder features multiple interchangeable heads that are capable of performing a wide range of operations. It is highly portable since there is no bulky control unit to lug around. The two position speed control and bi-directional controls on easy to operate. The whole system fits neatly inside a carrying case including the 7 interchangeable heads. The AC power adapter plugs directly into the bottom of the unit and the hi/lo speed buttons are located on the upper half of the front of the nail drill. The compact size and design make it really easy to use for grinding, polishing and removing excess cuticle from the base of the nail. The 7-Piece Professional Nail System from PureNails is a high quality tool that can be easily used at home or while you are traveling since it can easily be packed in a suitcase. It is extremely easy to operate with the 7 interchangeable heads that can be removed easily. The high-quality professional nail care kit from KEDSUM is an excellent value that can be used for home manicures, pedicures and for calluses and corns as well. It compact and portable so that it can be used when you travel as well as in your home to get professional quality nails without the high price. The nail drill includes 6 interchangeable metal bits and 6 sanding bands that come in a small organizer. The speed is variable from 500 to 20,000 rpm and the direction can be quickly switched between forward and reverse using the switches located on the remote control built into the power cord from the AC adapter. The kit comes with a number of extras including a glove, bonus tips. 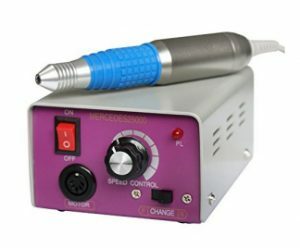 The KEDSUM Electric Nail Drill is a high quality unit that can be used in a salon or at home. It comes with everything you need to do your own manicure or pedicures and save yourself a whole lot of money. 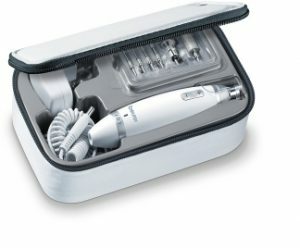 The Beurer Electric Nail Drill is perfect for home and salon use thanks to its compact and easy to handle design. It has a number of useful tips that are all interchangeable and everything fits neatly into a zippered carrying case. It comes with an exclusive LED light for illuminating the work area so that you be sure to see everything. The unit is really easy to operate, the variable speed motor can be raised and lowered by the touch of two buttons and the direction can be changed with a simple twist. The kit includes 10 quick interchangeable bits including multiple sapphire grinding heads and polishing bits. The package also includes a clear plastic dust shield and the LED light is extremely bright and shines plenty of light where you need it. 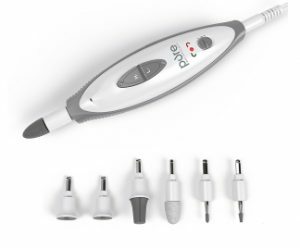 This Beurer Electric Nail kit is great value for what you get in the package, you get a variety of best metal tips and sanding bands. The carrying case holds everything organized and is convenient for taking with you on a trip. 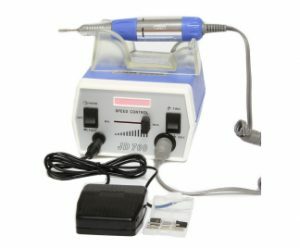 The Professional Electric Nail Drill from CO-Z is a best nail care system that can easily be used in a beauty salon as well as in the home. The main power unit contains all of the controls for the handheld drilling tool. This powerful electric nail drill is capable of reaching 30,000 rpm and can be varied by using the speed control knob on the front of the power unit or using the included foot pedal. The rotation of the bits can be reversed using the switch located at the lower part of the power unit. The kit also includes 7 interchangeable metal bits that can be stored on top of the control unit to keep them organized. As a bonus, CO-Z included a molded plastic cradle for the drill to rest in when it is not in use. This is one of the most powerful personal electric nail drill systems on the market today. It has 7 metal grinding bits that can be used on the gel, acrylic artificial nails and also natural nails. 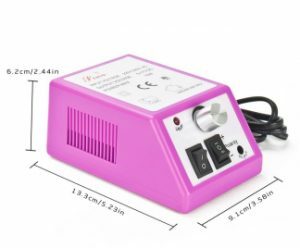 The ZENY professional quality electric nail drill kit features an easy to operate power unit that makes it really easy for the user to do their manicure and pedicure at home. The handheld drilling unit is perfectly shaped so that fits comfortably in the palm of the most users hand. It comes fully equipped with everything you will need care for your nails. The power unit is compact and features all of the controls for the variable speed, direction of rotation and the foot pedal that can be used to adjust the speed of the rotation up to 25,000 rpm. The kit also includes a set of 6 interchangeable metal grinding tips and six sanding bands. ZENY included a whole bunch of bonuses in the package; a finger separator, a molded plastic cradle, a set of assorted rhinestones. This powerful little & best electric nail drill has enough power to be used either in a professional nail salon or in someone’s home. With the low price, it really is a very good value for anyone looking to save a lot of money over what a beauty salon would charge. The CO-Z Professional Nail Drill lets you bring the experience of a salon manicure and pedicure in your own home. The hand drill unit is perfectly shaped, fits easily in the palm of your hand whether you are right or left handed. The variable speed control can be raised and lowered by the switch on the control unit or by using the included foot pedal. The electric nail drill bits and sanding bands turn at up to 25,000 rpm’s which provide a professional quality result every time. The kit includes a set of 6 grinding bits and 6 sanding bands packed in convenient storage case. The bits and bands are easily interchangeable in a drill with a quick twist (never touch a hot bit with your bare hands). There is a molded plastic stand included so that you can store it there when not in use. If you are looking for a way to save you money on your finger and toenails, you cannot go wrong with the CO-Z Professional Electric Nail Drill Kit. Belle makes it possible to anyone to skip the salon and do your own professional quality manicures and pedicures at home. This high-quality kit comes with everything you will need to do the job right the first time. The kit includes the electric nail drill and power unit with a set of 6 metal grinding bits and 6 sanding bands in a convenient plastic case. All of the controls are conveniently located on the front of the power unit for easy access which includes the variable speed knob and forward/reverses switch. The kit also includes an easy to use the foot pedal for more convenient speed control. There is a bonus molded plastic stand for storing the drill when you are not using it. 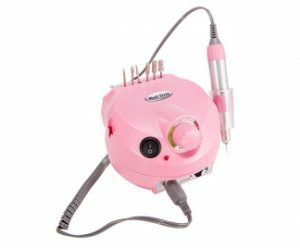 If you would prefer saving the money and doing your own manicures and pedicures at home, the Belle Electric Nail Drill would make a great choice. It comes with everything you will need to get started doing your own at home. Suday brings the beauty salon manicure and pedicure to the home for everyone to use with this professional quality unit. It includes everything that you will need to get started doing your own nails. It includes a set of grinding tips and sanding bands packed in a convenient case and a bag full of extra sanding bands (approximately 100). The electric nail drill set includes the power unit and hand drill which attaches to the front of the power unit. The control unit features a power knob that controls the rotation speed of the metal grinding bits and sanding bands. The rotation speed varies up to a maximum of 20,000 rpm and delivers salon quality results. There is also a direction switch which allows the direction to be switched from forward to reverse with the flip of a switch. 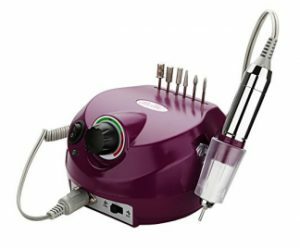 If you are looking for a home manicure and pedicure machine, the Suday Professional Finger and Toenail Drill is a really great option.